Welcome to the start of a new electronics book for model railroaders, Microcontrollers for Model Railroads. There are several books on model railroad electronics but most of them use old technology that you would never actually find on most modern day layouts. The modern layout is filled with embedded microcontollers - they are in your DCC system, your locomotives, your circuit breakers. While, there are many hundreds of books out on microcontrollers, they almost all concentrate on projects that are not directly applicable to a model railroad. 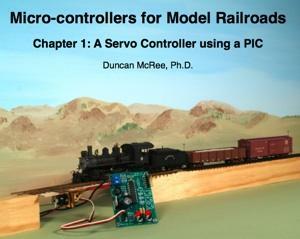 This book is going to directly tackle the subject of microcontrollers for model railroads. This is not a topic for everyone but my feeling is that there are many of you that can tackle this subject and would like to read this book. It would be a great opportunity for learning about embedded systems using your hobby. And many of you want to build more sophisticated electronics for your model railroad than can be done easily with passive components. The book will cover building a grade crossing with train detection, flashing lights and servo actuated gates based on a PIC microcontroller. I picked this project because it covers numerous circuit modules that could be reused in a number of situations. For example, the servo driver could just as easily be used to switch turnouts. The first chapter is available for download. The rest will come along slowly. I have to fit this project in amongst my other projects and I suspect the time scale will be somewhat faster than continental drift - but maybe not much. Please don't email me and ask when as it will only make them happen more slowly :-) However, this first chapter makes a perfectly usable turnout control based on a servo and can also be used for animation projects. That is why I decided to make it the first so it could standalone while I work on the rest. Enjoy!